Buying a telescope is tricky. It is tempting to start off with an inexpensive telescope (say, a $50 one) to see if astronomy is a pursuit worth pursuing, but that is exactly the problem. A cheap telescope will do nothing but turn you off because they are not much good for star gazing. The photos on the side of the packaging of the planets, stars and galaxies are most certainly NOT what one would be likely to see with a low-priced scope. This is why we always steer readers away from most low-priced telescopes as they are typically not worth the money. If you want a good telescope you can buy one retail, or you can do what the RainyDayScience team has been doing for that past few years and keep an eye out for high-end units on Astromart, EBay, or Craigslist. Astromart is the best source for hard-to-find quality astro items. The buyers and sellers are quite knowledgeable and the rating system is very trustworthy. EBay is great for accessories such as filters, eye pieces, and other more common items. For those interested in acquiring a telescope, Craigslist is the way to go. You get to see the equipment, check things out, and avoid having to have anything shipped. As the deals are typically done in cash, the only caveat is that you must know what you are buying. So photos, the exact model number, and knowing what is included as part of the sale are the obvious things to understand before meeting up. As one never knows when something good is going to pop up, the two things required with buying via Craigslist is patience and flexibility. Patience has paid off for the RainyDayScience team many times over the past three years (10″ Newtonian, Celestron C8, Meade 2045, 10″ Meade LX200 GPS, 6″ Celestron). While the team buy scopes when the right opportunities present themselves, they don’t always keep the scopes they buy. Sometimes the best way to pay for a better scope is to sell a few of the lesser ones. This is how the team upgraded to the 10″ Meade LX200 GPS (by selling the 10″ Newtonian and the Celestron C8). 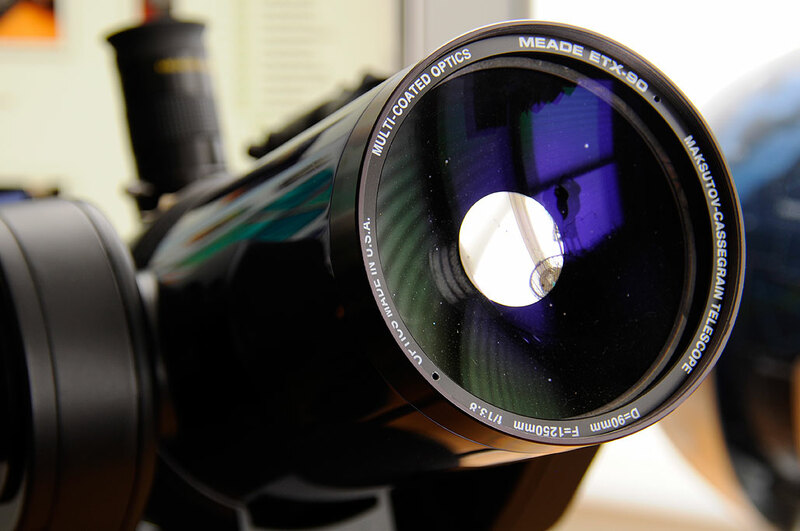 It is also how they were able to finance the recent acquisition of the Meade ETX-90 EC. When we purchased the Meade 2045, it came with a nice collection of accessories. We kept most of them as they should work well with the ETX-90EC. This new purchase also came with a few new accessories. The two items which we did not were are the 2x Barlow Lens and an LPR filter. The Barlow Lens doubles an eyepiece’s power while maintaining excellent image corrections. A Light Pollution Reduction (LPR) Filter is designed to selectively reduce the transmission of certain wavelengths of light, specifically those produced by artificial light. This includes mercury vapor, sodium vapor lights, and the unwanted natural light caused by neutral oxygen emission in our atmosphere (i.e. sky glow). Another cool accessory is the Autostar handset. This handset is an option for the ETX series which replaces the standard-equipment electronic controller. The Autostarprovides the scope with GOTO capability to over 14,000 objects, including deep-sky objects (galaxies, nebulae, star clusters, etc), stars (double stars, variable stars, SAO stars), the planets, and other astronomical objects. The purchase also included that Deluxe Field Tripod. 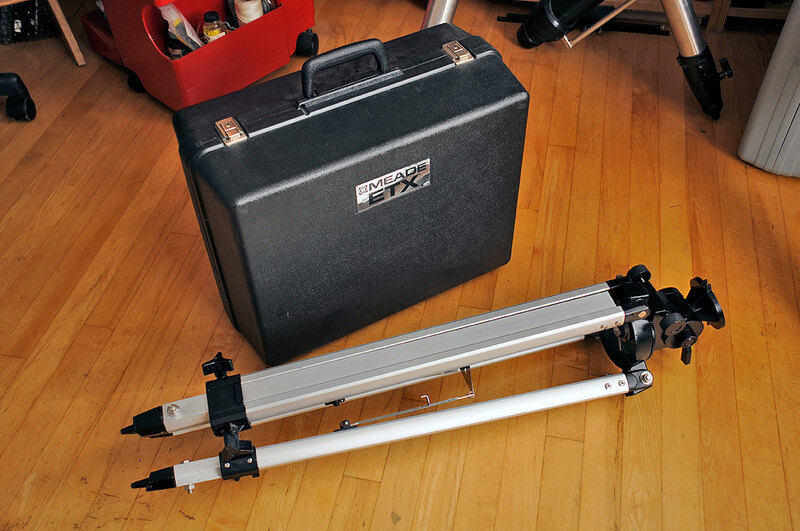 The tripod was designed exclusively for ETX-series astronomical telescopes. It is made of lightweight extruded aluminum and the height is adjustable from 34″ to 54″. This allows the user sit or stand while using the ETX-90EC. Micrometric controls in both azimuth and elevation-anglepermit precise polar alignment of the telescope’s fork mount for astronomical applications. 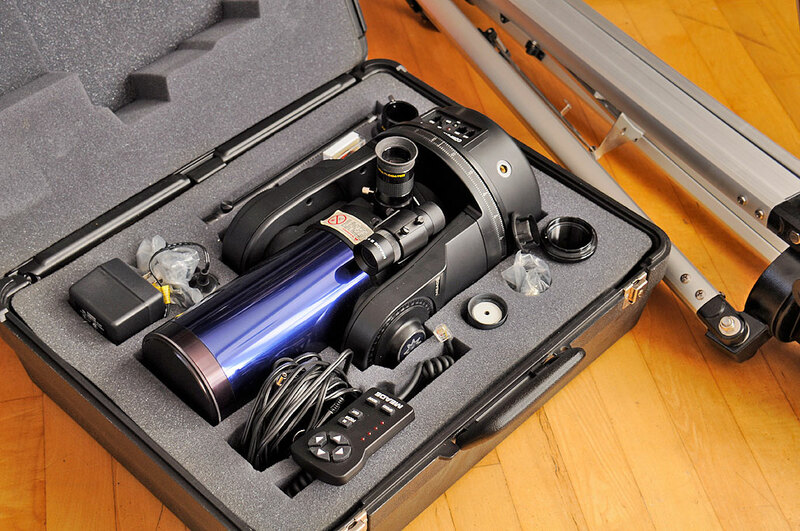 The Meade ETX-90EC is a smaller telescope compared to the Meade 2045. Some may say that the larger scope gives a better view. This is true. However, the ability to control the ETX-90 via a computer is something that makes the smaller scope a better grab-and-go unit. At 9 lbs. it is also a lighter grab. We will set up the ETX-90EC and see how it compares to the 2045 for image quality and ease of use. The outcome will decide which one we will keep for future astrophotography efforts.